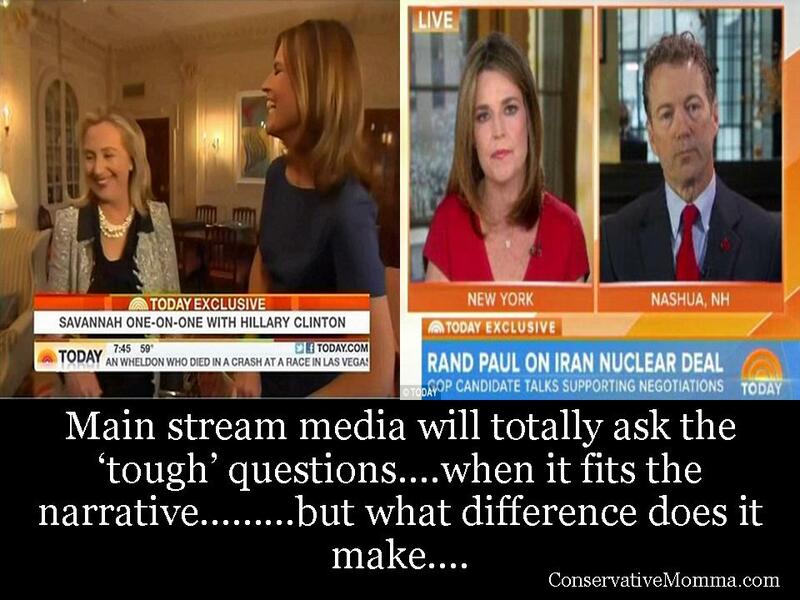 In the news today is all the hype of Savannah Guthrie’s interview with Rand Paul on NBC’S The Today Show. At first hearing this I was like “oh here we go”…..main stream media freaking out that Rand Paul wasn’t going to let a journalist control the message. Here’s the deal, you can’t -if you are a Conservative- let the main stream media control the interview….because they will make you look like a fool….we saw this with the Palin/Katie Couric interview back in 08, remember! I gave up all main stream media news sources years ago…..their “truth” is not the truth….this day in age- ya gotta hunt for the truth-and find it on your own. What was more amusing to me than this interview was the left’s portrayal of the interview. Rand Paul’s attacking a WOMAN journalist. “Poor Savannah Guthrie…..she was just doing her job!” 😦 Women are never weak and defenseless in the liberal world, but they will be when it fits the narrative. You see I wouldn’t have an issue with this, if liberal journalists did their jobs when interviewing LIBERALS AS WELL! But, you see….. that doesn’t happen….they throw soft balls to those with similar views all through the interview….no tough questions like the ones seen in the interview above. Savannah Guthrie, is not a weak women, but she was more then willing to let Chuck Todd step in and defend her from the “horrible Rand Paul”…why? Because it furthers the left liberal agenda of keeping any Conservative out of the Oval Office. Savannah does not need to be defended -the woman is a trial lawyer….she can hold her own. Savannah also previously worked at MSNBC (Liberal News Haven), and is married to Michael Feldman, a former Democratic political adviser. Savannah’s husband was also Vice President Al Gore’s traveling chief of staff. He also served on Bill Clinton’s campaign staff in the 90’s….in short…the guy is a major LEFTY. My guess is Savannah and Michael have politics in common. I also bet Savannah isn’t going to like anyone that comes on The Today Show, unless they are batting for the left. Today, we have to be very careful to fully seek for the truth in those that are interviewed….but we MUST also decipher who is the interviewer and what is their agenda…because like it or not-they have one! The best way to find the truth…..is to find it on your own. Oh….and p.s: if you want your candidate to be FULLY vetted, torn to pieces, have all dirty laundry aired- vote for a conservative….the mainstream media will get that job done! I’m not a big fan of Rand Paul but I was very glad to see him stand up to her in that interview. She was trying to point him to an answer and he was having none of it. I’d like to see more interviewees handle that bullying bunch the same way. Hey, curious on why you don’t like Rand? Was it the support of Mitch McConnell?